Momma Told Me: It's just a S'mores kind of day! As you know Summer is here, though many of my friends in the Eastern states might beg to disagree, and it is time to plan cookouts, family reunions, and lazy afternoons seeking shade from the sun. In SoCal, it is pretty much Summer all year round. It's a rough life, I know. Sarcasm aside, I always envied my cousins living back East. Their homes had fire pits and their family vacations consisted of campaign, glow fly catching, and all the delicious grilled food one could eat. Sure, they might have to put up with a few "inches" of snow, but that's a small price for the excuse to enjoy a freshly toasted marshmallow wedged between Hershey's chocolate and graham crackers. I can almost smell the S'mores now! Living in SoCal, our camping destination was the beach, and our local beaches have strict regulations about fire- absolutely no bonfires allowed. Now where's the fun in campaign under the stars, with the sound of the tide rolling in and out, without a freshly roasted weenie and some gooey S'mores? See, it WAS rough. But Momma knew how to compensate- she always had a way to get creative in the kitchen, and her love of S'mores was perhaps greater than all of us. I always knew it was going to be a great weekend when I got home from school and there was a pile of Hershey's Milk Chocolate bars, Jet-Puffed Marshmallows, an Honey Maid Graham Crackers sitting on the counter. Whether you're snowed in, or the weather's too hot to start a fire, 10 Minute S'mores solutions can turn a hum drum evening into a memorable event. 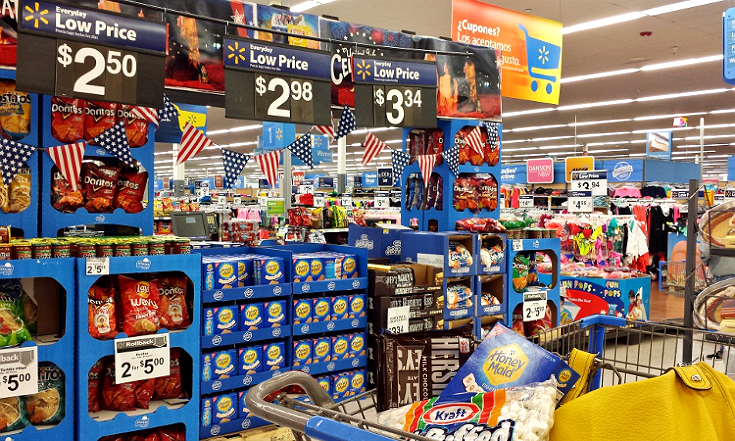 And, right now at your local Walmart, you can stock up on the 3 S'mores essentials so you're never caught on hand when a S'mores kind of day turns up. 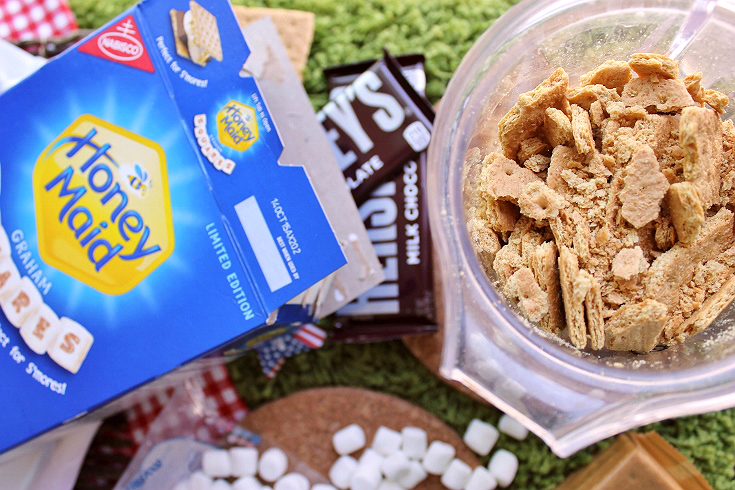 You'll find convenient 6 packs of Hershey's Milk Chocolate bars, individually wrapped, festive Red, White, and Blue Star shaped Jet-Puffed Marshmallows (and new square S'mores marshmallow varieties,) and Honey Maid graham cracker Squares, perfect for smushing, crunching, and grinding in your new favorite S'mores creations. 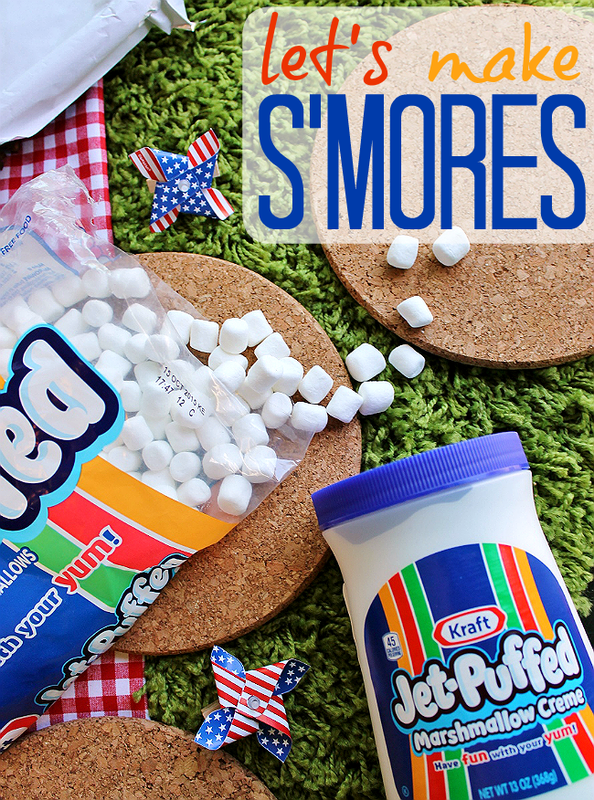 The great thing about S'mores is that you can make them any time, just as long as you have these 3 ingredients! 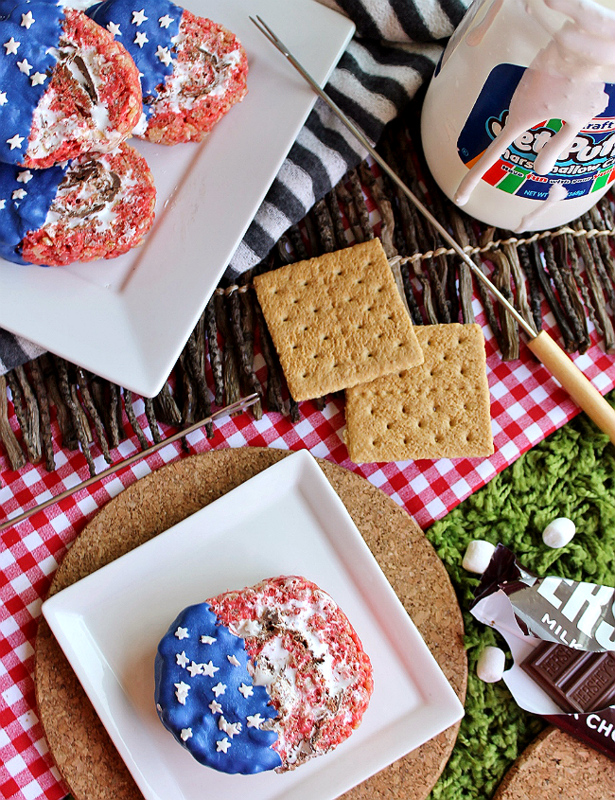 With a little creativity you can make S'mores anywhere- they don't have to be literally sandwiches of gooey chocolate graham mallow heaven, they can be a quick S'mores dessert dip, simple cake pops, or Momma's S'mores Krispie Pinwheels. Yes, Momma was queen of crafty S'mores creations, and she could whip up a delicious treat in 10 minutes flat! Her secret was to melt the Jet-Puffed marshmallows in a microwave safe bowl with a little butter for 30 seconds on High. Once the marshmallows were melted down a world of possibilities opened up. 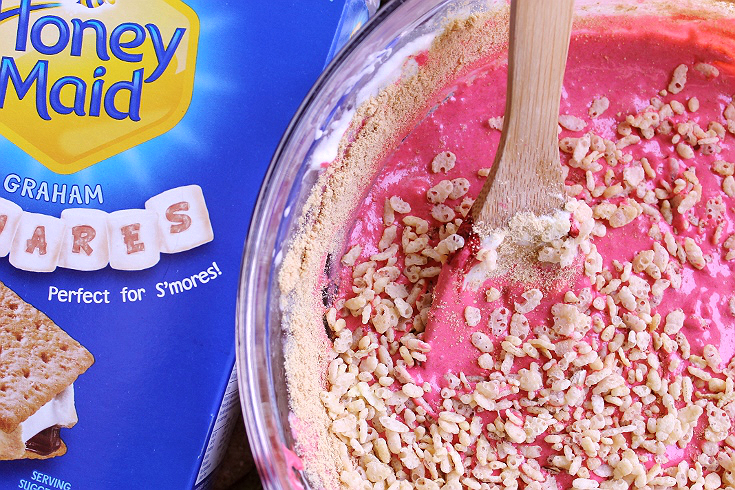 To create her S'mores Crispie Pinwheels she would then grind the Honey Maid graham cracker squares into an even consistency and stir it into the melted mallows, along with a few cups of crisped rice cereal. Next came the best part! Momma would tell me to hold my hands out over the sink as she sprayed them with cooking spray, then let me loose to smash the mixture, flat, into a prepared cookie sheet. If we had any extra mallow mixture leftover we'd spread a generous layer out over the bed of graham crispie, otherwise, there was usually a jar of Mallow Creme in the pantry! 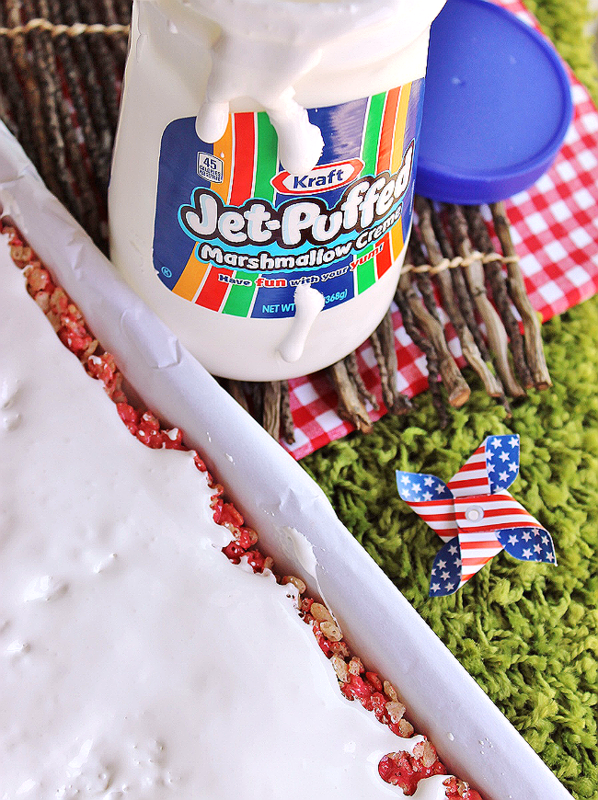 Spreading the mallows was usually a tough job; the homemade butter Jet-Puffed mixture often poured over even, while Marshmallow Creme took a little finesse and elbow work. 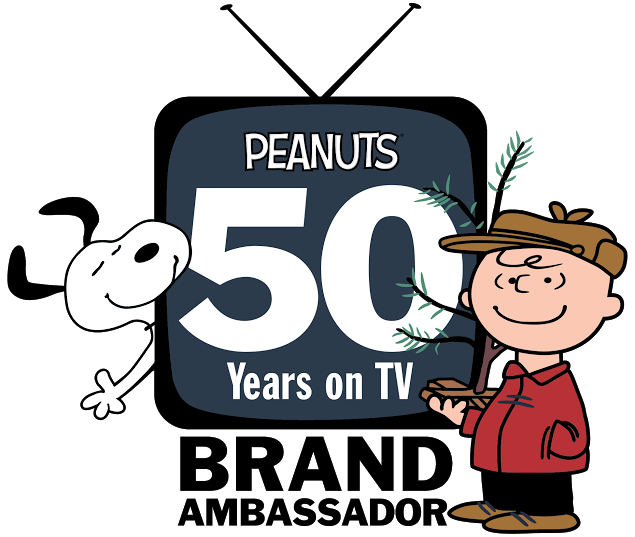 Then we would peel open 5 or 6 standard size Hershey's Milk Chocolate bars and lay the individual pieces out evenly across the sea of fluffy mallow. The oven was always preheated to a low 200F, and the cookie sheet went immediately into the oven for 2 minutes, exactly. Hershey's Milk Chocolate has a low melting point, which is precisely why it's the perfect S'mores chocolate, so it never took too long to reach the final steps. Of course 2 minutes seems like an eternity when you're a child, so Momma and I would take turns stacking marshmallows to see who could get their tower the highest. The winner always got a pieces of Hershey's, so it was tough competition! 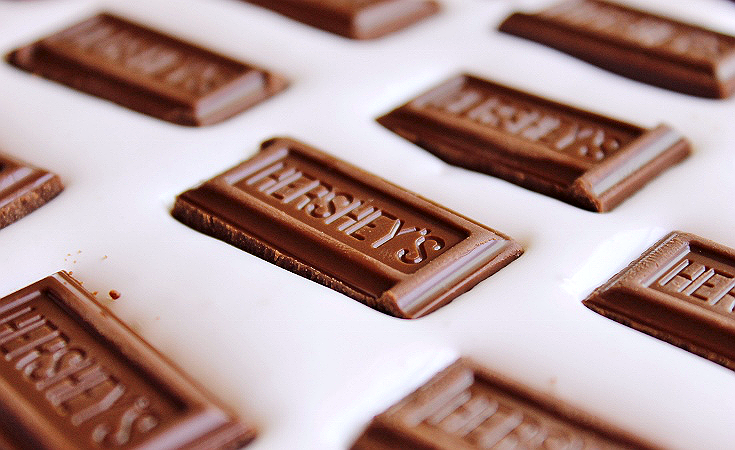 Fun fact: Did you know that a piece of chocolate is referred to as a 'Pip,' and one square of breakable, melt-able, delicious, Hershey's bar is called this? Once the cookie sheet had emerged from the oven it was time to spread the chocolate. 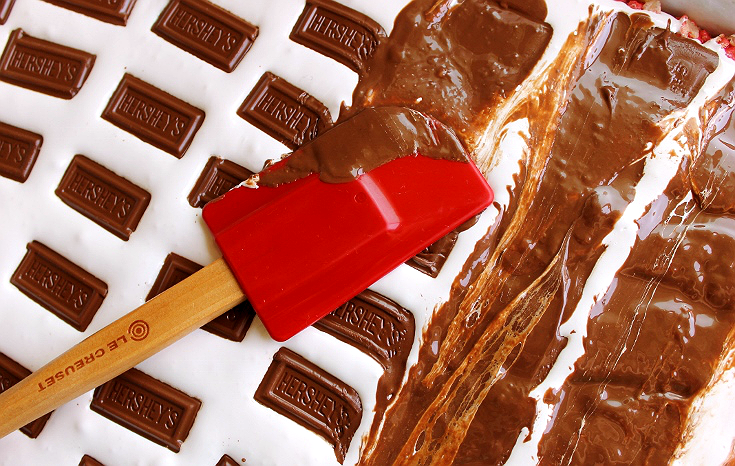 Using a spatula mom would lightly drag through the rows of Hershey's pips and I would watch, peering over the counter with my step stool, in wonder as the chocolate and mallow created rivers of delicious S'mores flavor. Then came the final, most integral, part to the pinwheel assembly- the rolling. I was never trusted with this step because the cookie sheet itself was half my height, and I was NOT known for my coordination. 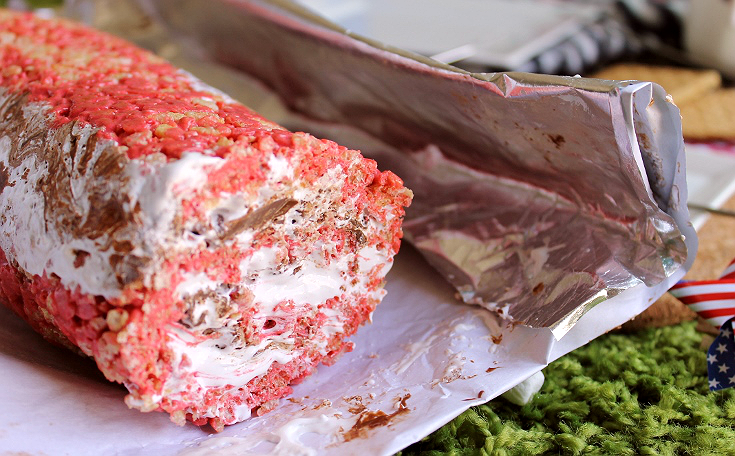 Carefully Momma would roll the crispie chocolate mallow sheet into itself until a giant log had formed. If the mallow and chocolate were still quite warm (usually because someone had forgotten about the oven in the midst of focusing on their marshmallow tower) Momma would let the sheet sit a few minutes before rolling. once rolled, inside the baking paper/foil, the roll would go directly into the freezer for 5-10 minutes. Both Jet-Puffed Marshmallows and Hershey's set quite quickly in the chill of the freezer and our log would be ready to slice and serve in no time. The language of S'mores is a universal one- few people don't burst into a smile when marshmallow is involved! These Smore's Crispie Pinwheels are great to make ahead and have on hand for any movie night, impromptu backyard grill, lazy afternoon by the pool, or trip to the park. The crunch of the graham crispie roll reminds me of biting into a graham cracker crust and the Hershey's Milk Chocolate- Marshmallow swirl softens to a playful texture after just a few minutes at room temperature. One batch made about 20 pinwheels- and it's a good thing this is such a quick recipe, because they didn't last long! Be sure to check out the #LetsMakeSmores hub for even more great Indoors S'mores ideas and recipes! What's your favorite twist or way to prepare S'mores? What Daughter Says: Make any day a S'more day with simple indoor recipes with big fun and flavor! 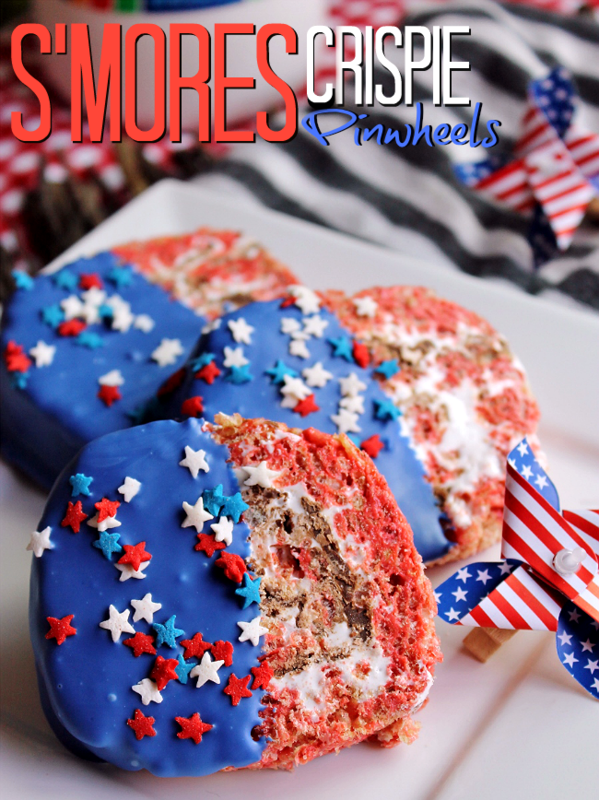 ***Click here for printable S'mores Crispie Pinwheels recipe. 1. Prepare a cookie sheet with a piece of parchment paper. Pulse Honey Maid Graham Squares in a food processor until a fine crumb consistency. Set aside. 2. Combine butter/margarine substitute and Jet-Puffed Marshmallows in a large microwave safe bowl, on high, for 30 seconds. 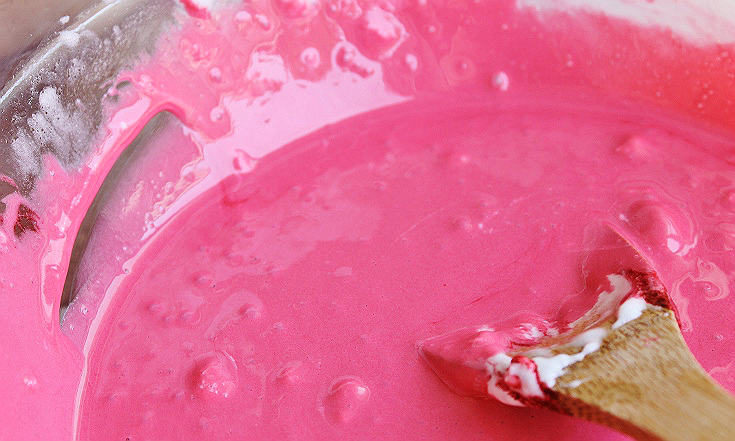 Remove from microwave and stir swiftly until all small chunks have dissolved into mixture. Microwave for additional 15 second bursts, if needed. 3. Stir puffed rice cereal and Honey Maid Square crumbs into marshmallow mixture. Press prepares graham crispie mixture into prepared cookie sheet. 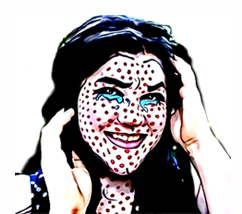 *You may spray your hands with cooking spray to prevent sticking, while flattening the mixture. 4. 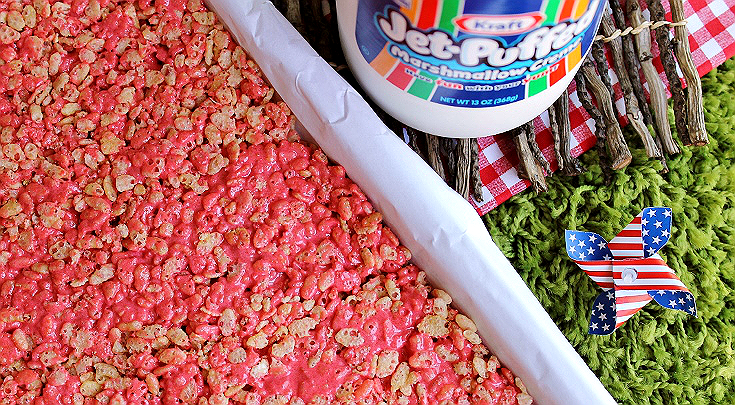 Spread Jet-Puffed Marshmallow Creme evenly on top of graham crispie layer. 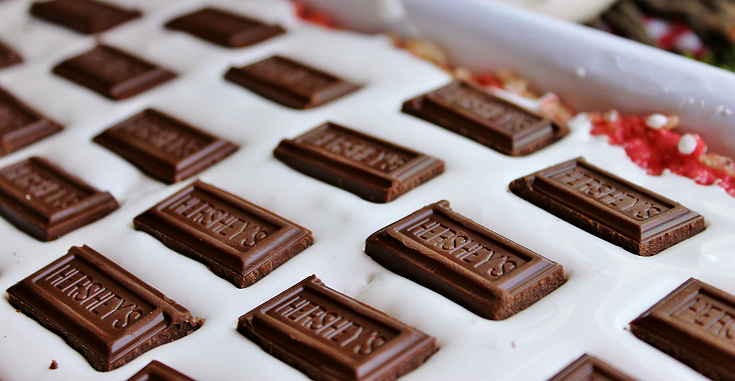 Break Hershey's Milk Chocolate into individual Pips and spread evenly across marshmallow creme layer. Place cookie sheet in preheated oven for 2 minutes. Do not over heat or you will have to wait for the sheet to cool before rolling! 5. 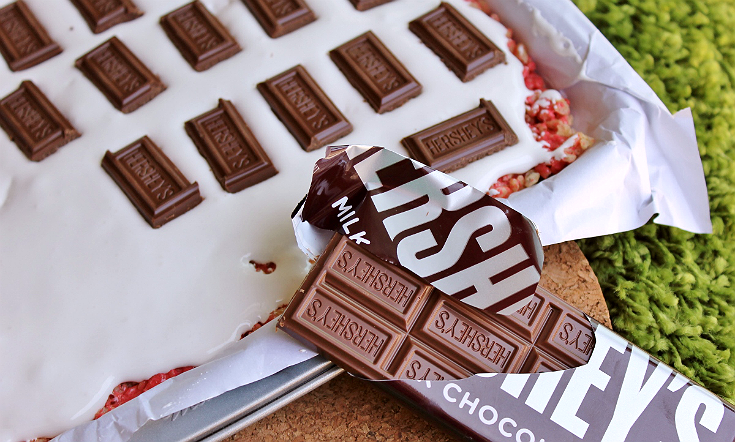 Remove cookie sheet from the oven and spread the melted Hershey's Milk Chocolate with a spatula. 6. Carefully roll the sheet in, and onto itself, from the narrowest end, as to create a log. Wrap the log in the parchment paper from the cookie sheet and place it directly into a freezer for 5-10 minutes. The amount of chill time will depend on your oven's heating and how cool the layers were prior to rolling. 7. Remove from the freezer and cut the S'mores Crispie log into 1" sections. Store in the fridge up to 1 week, or in an air-tight container, frozen for up to 3 months. Serve at room temperature or chilled. What a fun idea. My kids would love those. What a great and easy way to make a dish for a military holiday or family. I bet this taste s good as it looks. Yes! 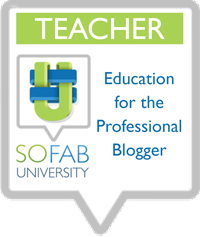 I love this recipe, and I love you for sharing it! This will be made tomorrow! What a fun recipe! 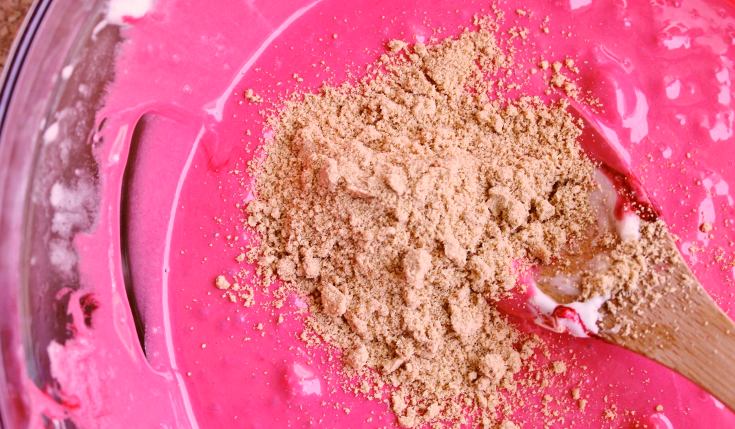 I totally love s'mores and end up making them all the time in my microwave. This is fantastic! Love the twist in making s'mores! 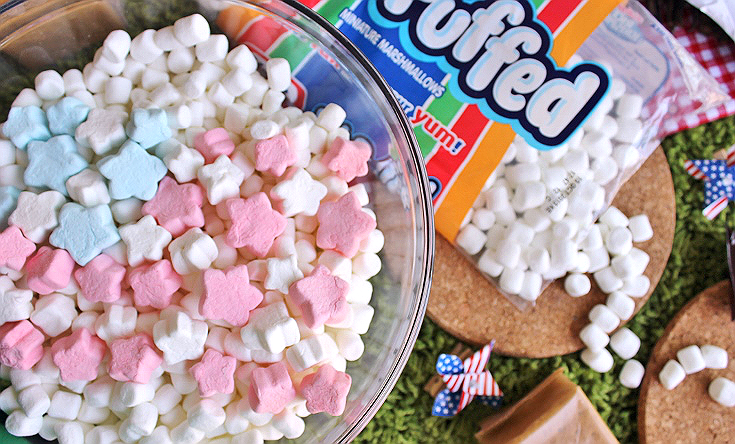 Can't wait to make this with my daughter for 4th of July! 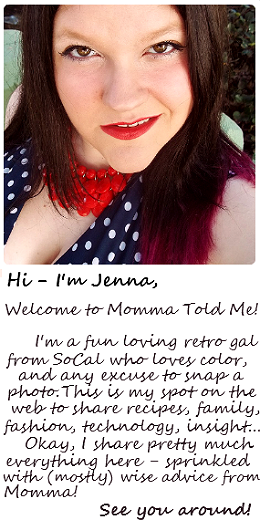 Oh these are so fun! They look really good and the colors ended up so vibrant! Summer is my favorite season! I live for cookouts and fun with friends and family. Wow! These look really amazing. What a great idea! Well doesn't that just sound amazingly good?!? I have never had s'mores like the but I would love to give it a try. These are adorable!! I love Rice Krispies they are a great easy treat, I never would have thought of this variation before. Oh my goodness. Can that look like it taste any more amazing? This is such a creative recipe that I would have never thought of. I love the combination of chocolate and rice cereal. 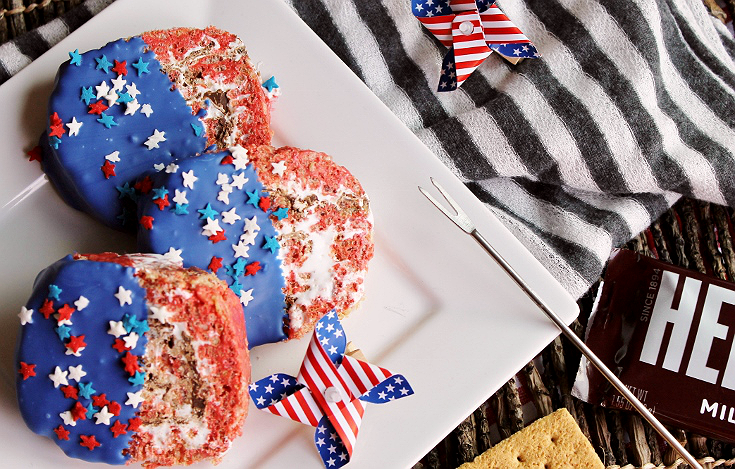 I love these colors - This would make the perfect 4th of July treat! !